Tuesday night was the State of the Union Address, and I was surprised it got the coverage it did with the big crisis going on in our nation. I’m sure you have been following the candy-heart crisis. 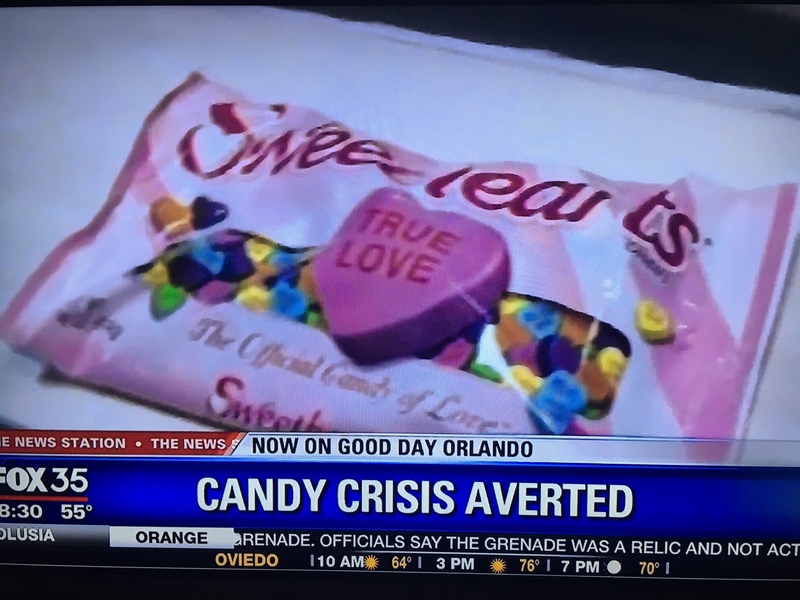 Evidently, the New England Confectionary Company (NECCO) abruptly stopped manufacturing its popular, not to mention iconic, Sweet Heart Conversation Hearts. I was shocked when I saw this covered on our local news. The shocking part was not that NECCO had stopped manufacturing candy. No, no. The shocking part was that this was called a crisis. The state of Valentine’s Day was coming into question. That’s what this world has come to. Seriously, folks, it’s not like M&Ms were going away. 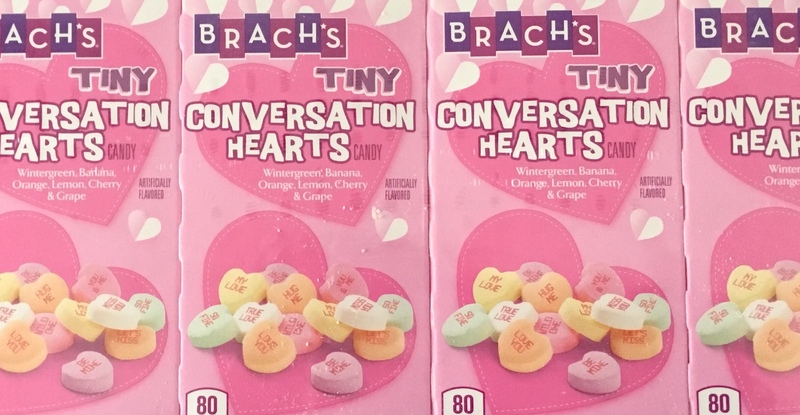 Anyway, to confuse things further, just last week I picked up Brach’s Tiny Conversation Hearts at Target – crisis averted! NECCO did not have the conversation heart market cornered, though it looks like big conversations are now a thing of the past. If you are clever, you can string many tiny conversations together and make one normal size conversation. So, don’t despair, just join in a candy conversation of whatever size you can. Your Valentine’s Day should not be hindered in the least. Now, on to more pressing things. Thanks to all of you who commented on my blog post last week and to those who shared. 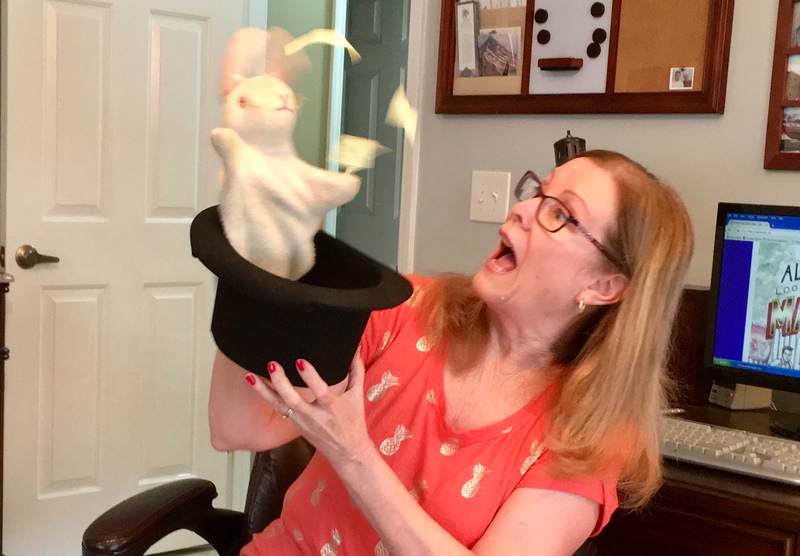 The winner of my book, ALWAYS LOOK FOR THE MAGIC, is Vanessa Marks. I will be in contact with you to get the particulars to send it to you. Help me celebrate and enter to win! 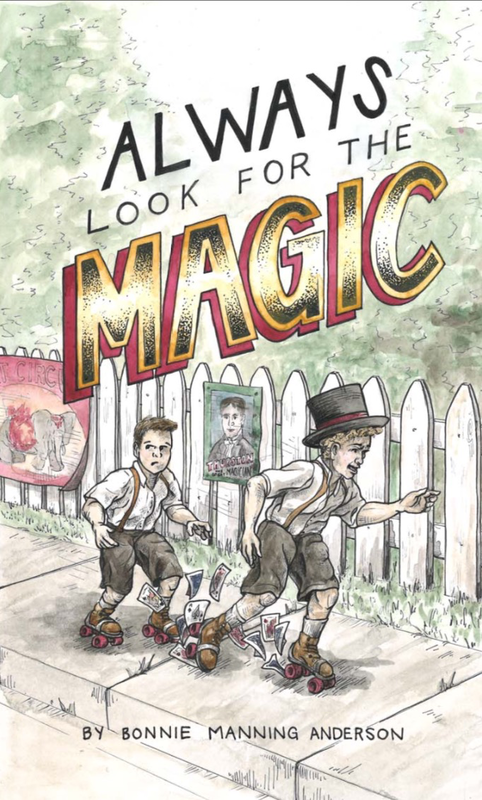 Today is the one-year anniversary of the release of my book, ALWAYS LOOK FOR THE MAGIC. I know! How time flies. In case you are new to me, this is my first book and is about an 11-year-old boy and his brother growing up during the Great Depression in Baltimore. Artie wants to be a magician, and the path he is on gives you lots to smile and laugh about while you wait to see if his dream will come true. I have had a blast promoting my book this past year. I have done book signings, a You Tube promotion, and visited a classroom of middle-schoolers to discuss the book and encourage future writers. This I did with my 90-year-old mom, who is one of the characters, and that made it truly memorable. The kids loved her and pelted her with questions. Writing about someone you know and love keeps you connected with them in a very unique way. This book is based on my dad’s life and was born out of my trying to remember all the stories he told about those days in the 1930s. Initially, I thought ALWAYS LOOK FOR THE MAGIC would be for 9 to 13-year-olds, but its appeal reached their parents as well. This really blessed me as I love a book that crosses generations. What I didn’t expect was the response I have received from folks in their 80s and 90s. I have received messages, letters, and even phone calls from people who have enjoyed a trip down memory lane to a time when things were simpler but life was hard. There you have it. My book has appeal for people from 9 to 99. I am honored. Share on social media. Be sure to let me know that you’re sharing in the comments here so you get credit. Mention Facebook, Twitter, or wherever you share. One entry per share, so double up. Follow my blog. I know many of you already do, but let’s give new readers an extra chance to win by clicking on the right column (under my picture with the monkey on my back) where it says to sign up. That’s it! I’ll announce the winner in my post next week. As always, thank you for reading and thank you for sharing. I was preparing to put away my many Christmas decorations, when I made the above statement out loud. It made me stop in my tracks. I wasn’t swearing, I was talking to my manger scene. I’d never talk inappropriately in front of Baby Jesus. I wasn’t thinking of the beauty of Christmas and the blessings of the season. I was missing Christmases gone by and looking at the work involved with packing it all up until next Christmas. I was contemplating which grandchild might want which thing when they start their own households and wondering when I would start to streamline my decorating. That’s the context from which I uttered that weird, easily misunderstood sentence. The letdown after the holidays is real. We go from shiny and bright accompanied by cookies, candy, and company to ordinary life without the twinkling lights. Returning to the normal of pre-Thanksgiving is lackluster. Plus, it gets dark so early – even in Florida! But I was ready to get my house back to normal. I was even ready to vacuum all the mess from taking the tree down. I just wasn’t ready to be productive. I wasn’t ready for those January fresh starts. That’s why I don’t do them. For me, every year is 13 months. It starts January 1 and ends January 31 of the following year. That allows me to be fairly guilt-free in January. I use January to put away Christmas, organize, vacuum, and nap. I also use it to think and pray about projects, especially writing projects, all this while consuming the leftover Christmas sweets. It’s very effective. So, until I can once again think with a non-sugar-coated mind, how do I snap out of being so melancholy? I do what I always told my kids and grandkids to do. I use my words. I talk to God. I talk to Bob. I talk to friends. My big thing this year was that I felt like I had used up all my encouragement and every word swimming around my head about myself sounded like condemnation. I was tearing myself down. I asked God for encouragement to get me moving. I didn’t want to stay in that negative, self-absorbed place listening to lies of the enemy. I was tired, too, so that made it worse. But God is always faithful. The next day I spent part of my morning quiet time with God just being thankful – specifically for the way that people in my life have encouraged me in the past. I named names (for instance, Vanessa). I remembered. Gratefulness is powerful. The fog started lifting, but I kept my fog lights on. I know how this works. Sometimes you drive in and out of fog before it’s really gone. But there was a breakthrough, which brought more thankfulness. In the afternoon mail a letter came for my mom. She read it and gave it to me saying it really was more for me than for her. It was from a woman whom my mom had met through my dad. Dad was in WWII. He was a gunner in the Pacific theater. The men he flew with became his wartime family. Years after the war, Dad started contacting all the men from his crew. He found out about their current lives and made a newsletter featuring each man and his family. He’d mail it out to the crew and keep their friendship alive. It was not unusual for me to find pictures of children and grandchildren from this group sitting on Dad’s desk. He and mom visited many of them throughout the country after retirement. To say this was special would be an understatement. You may remember that my dad died in 2017. He was the last of his B-29 crew. I always thought it was fitting that he was last. God used him to keep them in touch with each other. The letter was from a woman named Mabel. I remembered her husband’s name from Dad’s stories. Mabel was writing to tell my mom that she was reading my book, Always Look for the Magic, and couldn’t put it down. She said she could picture my dad as she read it and she was enjoying laughing along with his antics. She wanted to thank me for writing it. She requested that I send her a card with my autograph on it for her to paste inside the book so she could keep it. She also said she hoped I would write more books. Well, I was flabbergasted. This sweet woman, who is probably around 90 years old, took the time to write such a beautiful encouragement as part of her correspondence to my mom. She certainly inspired me, not only to write but to take more time encouraging others. Encouragement is food for the soul. When was the last time you received encouragement out of the blue? How about the last time you gave it? Writing it down and sending it to someone gives them something that lasts. I’m hoping that comes back in style. I think we should fill our January with uplifting words to people. Don’t you? By the way, if you haven’t ordered my book yet and would like to, click on the picture of it on the right. Thanks! Writing my book, Always Look for the Magic, started out as an exercise to keep memories alive, to keep those stories that my dad told from disappearing. It turned out to be much more than that for me as I wrote and edited. It became a connection with my parents and their families before me. Especially Tommy (my Uncle Tom). Uncle Tom passed into Heaven last month. 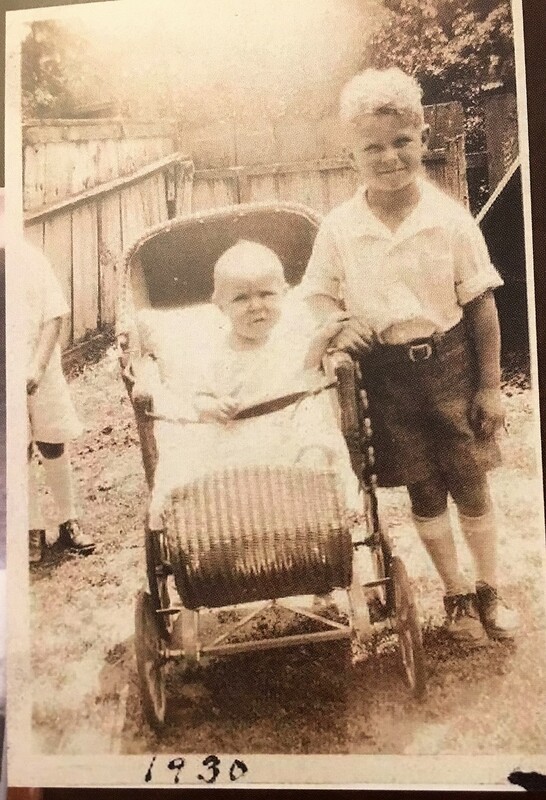 My dad, Arthur, the big brother, has been there since last October. It is a comfort to know they are together again. I grew up in Maryland and lived close to tons of relatives on both sides of the family. My parents grew up across the street from each other, so everyone knew everyone else. When I was six, we moved from the Baltimore area an hour away to near Andrews Air Force Base where my dad worked. I’m not sure exactly when, but at some point, Uncle Tom, Aunt Audrey, and their three kids moved our way. We saw them a lot. I know that as a kid I didn’t appreciate what was being built by those times together. It may have looked like eating dinner, playing badminton in the backyard, an epic game of Monopoly, or listening to the more musically inclined jamming in the basement; but it was family building blocks. Blocks of time that knitted us together. Now we are all over the country. My three siblings and I and those three cousins all live in different states. Different regions, too. We don’t see each other often – in some cases it’s been over a decade. My cousin, Mark, and I have kept in contact more due to the fact that we both had our dads living with us and both had the privilege of being with them during those last days and weeks. We understood each other. It was comforting. How does it work when you haven’t lived near each other in over forty years, that you can talk like best of friends? It works really well. For us, it’s aided by the fact that our dads both were Christians and we are, too. But I also know that somewhere deep in the foundations that were built when we were young, there was always a bridge to family. It’s like a draw bridge that you can lower and reach out to each other across the miles whenever you need to make the connections. It’s amazing. I had a texting conversation with my cousins that lasted nearly two hours. We sent each other pictures and reconnected where necessary. We joked around and made fun of each other. I laughed and I cried. What a gift! As a tribute to my Uncle Tom, I want you to know that he was a truly wonderful uncle. When Bob and I moved my parents into our house last September, he was on the phone to me with unsolicited (but good) counsel. “Bonnie, it’s not easy living with old people,” he told me. I’m not sure if that was a quote that he picked up from my cousin when they moved under the same roof or if down in his basement he kept an even older person than his 88-year-old self, but I appreciated his call. Hum, I wondered, what had it been like for my poor cousin and uncle during their transition? I’ll be sure to never ask! “Also, my brother can be difficult,” he added. After my dad died, Uncle Tom called my mom about three times a week to check on her. They had been like best friends/siblings growing up together. They shared their love for the Baltimore Orioles and music and, of course, my dad. As my father’s hearing reached the point that made telephone calls difficult, Uncle Tom and Mom did most of the communicating, especially during baseball season. Uncle Tom would call and complain about the Orioles or they’d relive the highlights of a victory. Two of my own sons are Oriole fans like their grandmother and uncle. Eleven years ago, our son Jesse was growing concerned that his grandmother had not been to Camden Yards since its opening in 1992, so we made it happen. Of course, we took Uncle Tom with us to the ballgame. This was the first up-close-and-personal experience that Jesse had with his great-uncle. It was love at first sight as Uncle Tom let Miguel Tejada have it for messing up at shortstop – standing up and booing him and telling anyone who would listen that the Orioles should get rid of him (in so many words). Since my dad was more of a fan-by-marriage, Jesse had never experienced a rabid Oriole fan of the male persuasion. It made his day. What a fond memory that is for me – four generations at the iconic ballpark bonding over the Baltimore Orioles. More important than his love for the Orioles, he was a prayer warrior and vocal about his walk with Jesus. I liked the way he referred to my dad as his big brother. I also can’t forget hearing him call his two sons “the beauties.” He was always part of my life whether near or far. I will miss him. We Interrupt My Regular Blog for This FREE OFFER! I have a short post for you today. So many of you have encouraged me along my journey of publishing my book, ALWAYS LOOK FOR THE MAGIC. So many of you have bought and read it. I’m very touched by that and very grateful. I do know that sometimes people intend to do things and put them off, because that’s what I tend to do way too often. So, I won’t assume that all of you who would like to purchase my book have. With that in mind, today through Friday, you can download the kindle version for free. I wanted to make sure that you know so you can take advantage of this offer. So click away right now and get it free today through Friday. Don’t wait, get it today! When you click the link and see that it’s the Kindle version that is free and you don’t have a Kindle (you can always buy one or), don’t worry, you can download the Kindle App and read it on your tablet or computer. Don’t forget to leave a review when you finish! And please share this post! Thanks again! I’ll be back tomorrow with my regular posts. Until then! Wouldn’t you, like to buy a book, from me? 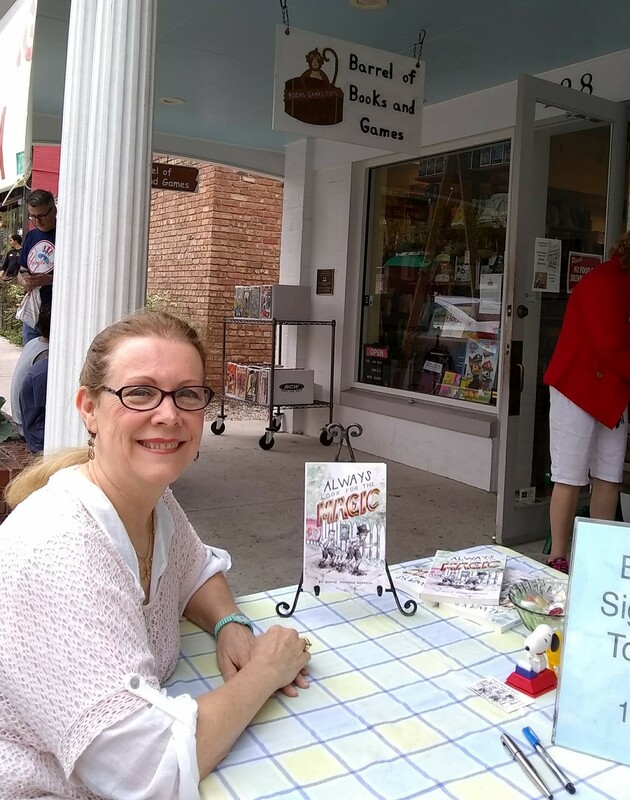 It was a beautiful day for my first book signing. Bob and I were joined by our friend and Prevail Press publisher as we set up in front of the Barrel of Books and Games in Mount Dora. I wasn’t nervous, I’ve sold things before, but this time it was like I was selling myself. (You know what I mean). For years I was a Tupperware lady. That is a lot like being a stand-up comedian who specializes in food freshness. You engage people and make them laugh until they realize that, not only do they like that bowl, but they must have it. It translates – yesterday a bowl, today a book. We barely had my books on the table when an extremely friendly woman literally ran up to us saying that I had been chosen as one of two that she was going to stream live. She was using all the right wording to make me believe that she was a sweet Christian lady and probably worked for the Chamber of Commerce. 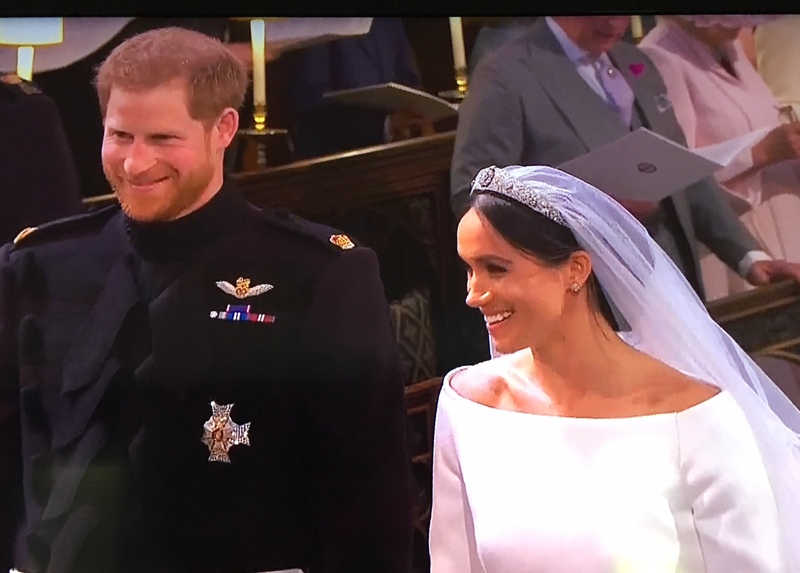 We all looked at each other in that way you do when you can’t quite believe you’ve found such good fortune. My baby book is one month old now! I thought I’d give you a little update. I am overwhelmed by the love and support I have received from you, my wonderful readers and friends. You shared my post about my new book over 20 times, and I have received an enormous amount of encouragement from you in my comments and on my Facebook feed. Thank you! I have to say, I’m having the time of my life. This is a dream come true for me. It is made possible by my friend and writing mentor, Rob Swanson, who is the creator of Prevail Press, the micropublishing company that has walked me through the entire project to create this beautiful book (illustrated by Anna Kester). Rob has a vision to enable good writers to publish good books. He knows the challenges of traditional publishing and the time involved in that pursuit and realizes that it won’t work for everyone – actually it won’t work for most of us. I love his business plan. You can check it out here and see what is going on in these beginning stages of Prevail Press, as well as meet their other authors. In addition to all of this, I am now a YouTube star! I know what you’re thinking – it was just a matter of time. Please check out my video explaining why I wrote the book. Filming it was one of the weirdest things I’ve ever done, but you have to give the public what they want! 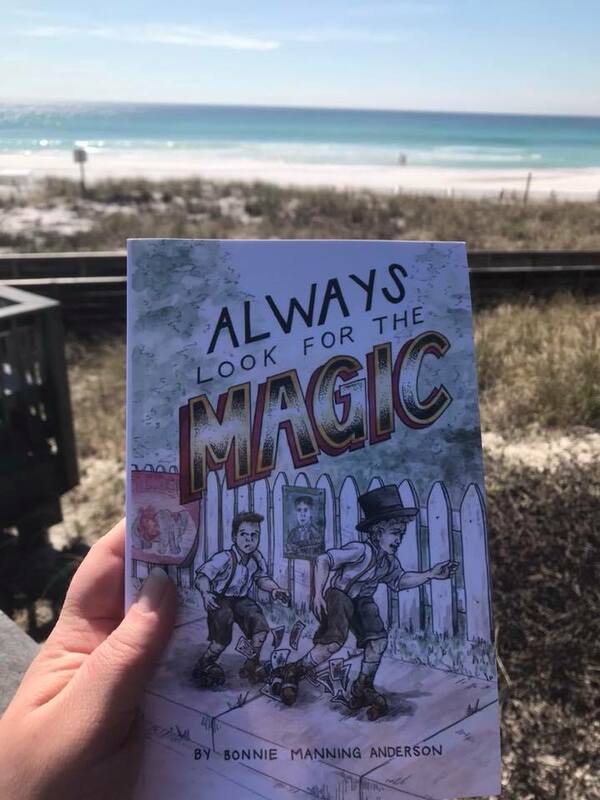 Thanks again and remember, just in case you haven’t ordered it already, ALWAYS LOOK FOR THE MAGIC is available through Prevail Press and on Amazon in both print and electronic versions. 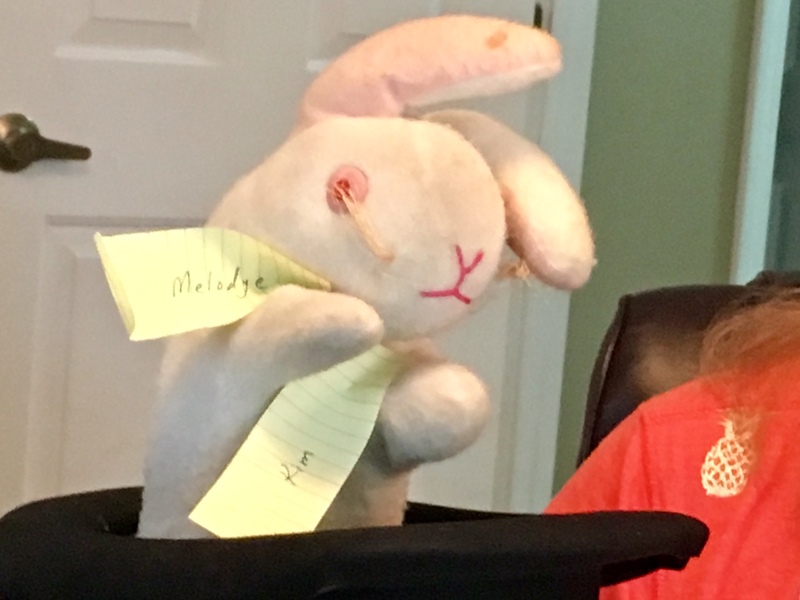 I had the hare-brained idea to get my dad’s Bunny Rabbit out of retirement to select the names of the two people who have won a copy of my book. He was so excited, he spent all afternoon at the hare dresser. Bunny Rabbit was always a wild and crazy guy. He’s a little unconventional. He usually made a huge mess when he would assist my dad with his magic act. He is soft-spoken (he does have a hare lip), but his heart is in the right place. One at a time, Bunny Rabbit! I put all the entry names in his hat and asked Bunny Rabbit to choose one and then another. I don’t think he entirely understood me as he immediately started throwing things around. So, I adjusted my plan accordingly and decided the last two names in the hat would be my winners. Congratulations to Melodye Jones and Kim Sutter. You are the winners! I will contact you soon about getting a book to you. Remember, Always Look for the Magic is available on Amazon at https://www.amazon.com/dp/097932517X.